Two people were injured and another is missing in Cresson, TX (near Fort Worth) after an explosion and fire on Thursday at 9:45 a.m. 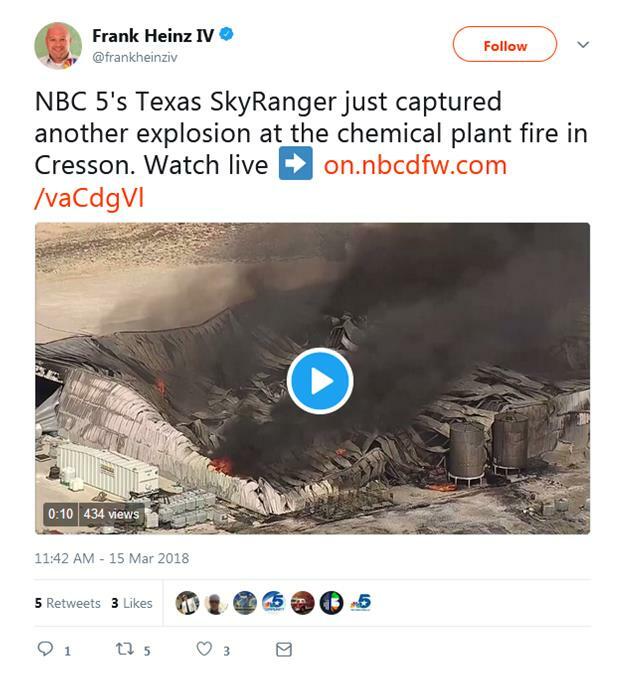 The plant appears to belong to Tri-Chem Industries, a chemical blending facility. Some reports have identified it as a fertilizer plant. Update: Officials recovered human remains about 3 p.m. on Wednesday, March 21st and they are believed to be those of Dylan Mitchell, 27, the one worker who has remained missing since the March 15 fire and explosion, according to officials. At least one more large explosion was captured by cameras and posted to Twitter. Plumes of black smoke from the plant closed a nearby state highway. Texas has been the scene of other plant explosions in recent years, including the Arkema facility in Crosby after Hurricane Harvey and a massive fertilizer plant fire in West in April 2013 that claimed 15 lives. In the minutes after such chemical disasters, knowledge can save lives. Twelve first responders to the Arkema explosion were injured by exposure to unknown contaminants in the fire. In today’s explosion, first responders were held back for their safety. For surrounding communities, knowing how to react–whether to evacuate or shelter-in-place–is a matter of survival. Texans living near chemical plants and refineries know this all too well, but it can still be impossible to make the right decision without accurate and timely information. Last legislative session, Rep. Eddie Rodriguez filed HB 1927, which would have establish a system to alert neighboring communities when a facility releases toxic chemicals or experiences a chemical disaster. Unfortunately, the bill never made it out of of the House Committee on Environmental Regulation. But each time a disaster such as this occurs, it underscores the need for such legislation. The bill would have directed the State Emergency Response Commission to develop a statewide system to inform the public of chemical emergencies in a timely manner using a multi-media approach, including traditional media, social media, and wireless emergency alerts. Just like the Amber Alerts for missing persons and emergency weather alerts available on our phones, a Chemical Emergency Alert System should be available to keep our communities safe. Call your representatives or candidates and ask them to support chemical emergency alerts.